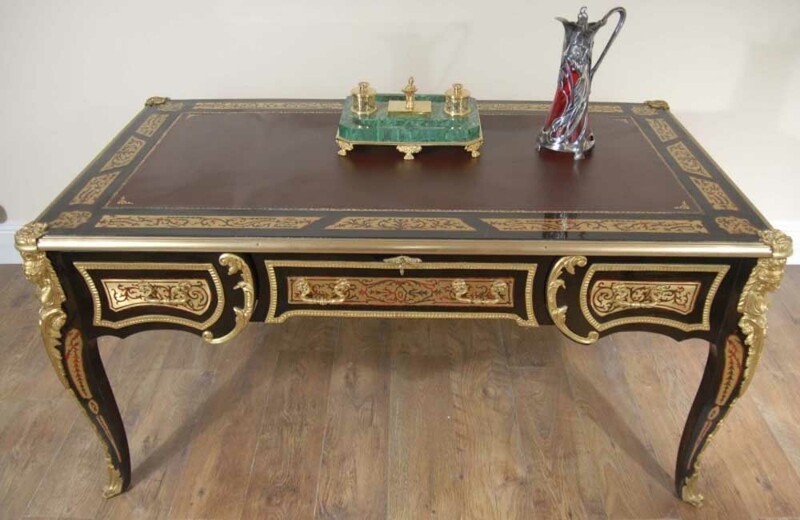 You are viewing a fantstic Boulle style writing desk with red leather top. The piece is the height of style, elegance and workmanship and is offered in perfect condition, ready for home use right away. As illustrated here, the Boulle style is best known for the type of inlay, consisting of a veneer of red and black faux tortoiseshell inlaid with brass or other attractive metals. The amount of time and levels of craftsmanship that goes into something like this is breathtaking, especially when you imagine how each individual shape to the brass has to be cut out and then embedded into the main structure of the desk. The desk has three drawers to one side so would be perfect for your home or small office. The piece is so elegant it can also work on its own as more of a decorative piece too. We bought this at an auction house in near Versaille, whilst on a buying trip in France. Pieces of this quality are rare so we are expecting a lot of interest on eBay. Boulle, André Charles (1642-1732), French furniture designer, who developed a style of furniture inlay that came to be known as Boulle or Buhl. As cabinetmaker to Louis XIV, he produced desks, cabinets, clocks, chests, and even parquet floors, working in an ornate Baroque style. He is especially noted for highly coloured inlays of exotic woods cut to shapes that form arabesques, landscapes, or flowing draperies. The distinctivetype of inlay that he developed and that bears his name consists of tortoiseshell with inlay in brass, pewter, or copper. His influence continued into the 19th century.